Use boiling beef, chuck, brisket etc. Take any 3 to 5 Lb. roast and use a large knife to cut slits completely through meat. Insert slivers of garlic and onions into these slits. Onions alone may be used if you do not like garlic. Put beef in a bowl and pour one cup vinegar over it. Make sure the vinegar runs down the little slits. Place in the refrigerator from 24 to 48 hours. 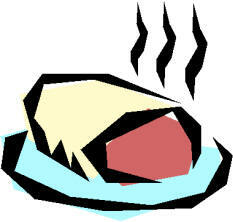 When ready to cook discard the vinegar and place meat in heavy pot and brown in oil until nearly burned on both sides. Pour two cups of strong coffee over the roast. Add 2 cups of water and cover. Cook slowly for 6 hours on top of stove. Do not season with anything else until 20 minutes before serving then add salt and pepper. One half cup of gin or whisky may be added to the boiling mixture. The gravy may be thickened if you wish.